T-shirt I bought from a sidewalk stall in Yangon in March. 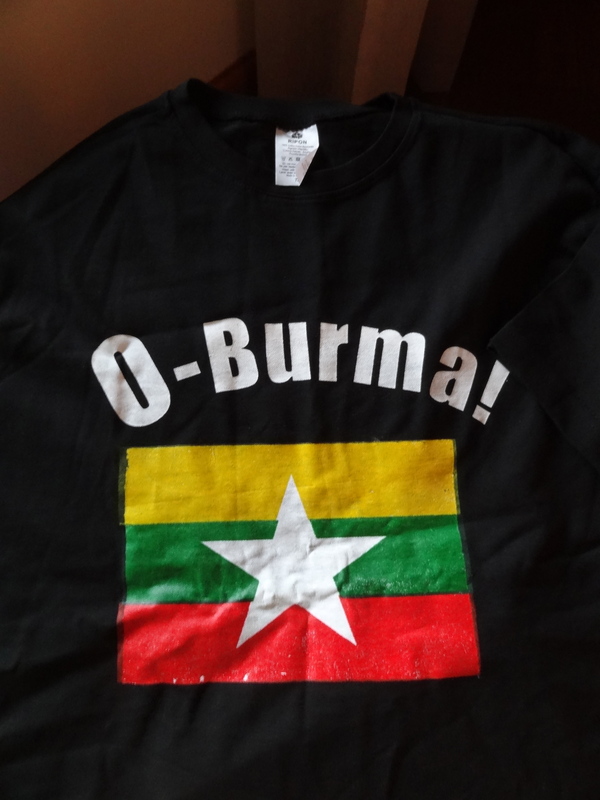 The shirt commemorates President Obama’s visit to Burma last year. Burma’s President Thein Sein is visiting Washington this week to meet President Barack Obama as the U.S. continues its push to support progress toward democracy in the once-closed Southeast Asian nation. The efforts include USIP work with partners on the ground who want to adopt rule-of-law standards and are searching for ways to defuse religious and ethnic tensions. The state visit marks the first in more than four decades by a leader of Myanmar, which the State Department refers to as Burma, its name before the military junta changed the name of the country and its capital in 1989. In November, Obama became the first sitting U.S. president to visit Burma. He was accompanied by then-Secretary of State Hillary Clinton, who had first visited in 2011 and then in September 2012 welcomed Nobel Laureate and opposition leader Aung San Suu Kyi to Washington, where she gave her first public address at USIP. Burma “is seeking to rejoin the world community after so many years of isolation and authoritarian rule,” said Colette Rausch, director of USIP’s rule of law program, who conducted training with colleagues in Burma in February and March. Religious tensions have developed during the transition in western and central Burma between certain communities of the nation’s majority Buddhist religion and minority Muslims. The strains have erupted into clashes that have heightened fears the violence could spread. Dealing with that will require not only encouraging public tolerance of other beliefs, but also exerting legitimate legal authority against those who commit violence to hold them accountable, Rausch said. Burma has the advantage of existing inter-faith networks that can be supported for maximum effect in maintaining peace. “In any sort of change, you’re affecting power structures,” Rausch said. Thein Sein “is going to have to navigate that and deal with the root causes of the issues,” such as political and economic factors that play into the tensions and affect the country as a whole. Asked about the visit in advance of Thein Sein’s arrival, State Department spokeswoman Jen Psaki praised Burma’s reforms thus far and urged its leaders to continue such efforts. The government released about 20 political prisoners before Thein Sein’s trip. While that brings the number freed to more than 850, according to Psaki, human rights groups say many more political prisoners remain in detention.